Perfect for those wanting to emphasize upper-arm strength and size. The extreme angle of the Ergo-Tech arm pad ensures resistance throughout the complete range of motion. The arm pads smaller size enables users to place only the triceps against the pad for more isolation and protection of the elbow joint. 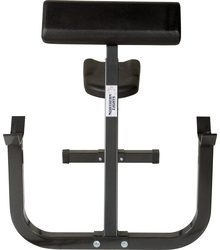 The large bar holder is cushioned with a rubber pad to keep this bench looking great.